What Is the Fluoroscopy Diagnostic Tool? Fluoroscopy is an imaging technique used by medical professionals to visualize internal organs while they are in motion. If an x-ray is a still picture, fluoroscopy is like a movie. The images are projected onto a monitor very similar to a television screen. This is very helpful for doctors because they can see exactly how an organ is functioning. For example, when fluoroscopy is used during a cardiac catheterization, the physician can see how blood is moving through the blood vessels and where there are blockages. Fluoroscopy can also be used to aid in the insertion of catheters into bile ducts or the urinary system. Fluoroscopy can be used on many parts of the body. Sometimes a dye or contrast material is used in conjunction with fluoroscopy to help medical experts visualize how the substance is moving through the body. A good example would be barium, which is used during a fluoroscopy of the intestines in order to see it moving through the bowels. Other examples of the use of fluoroscopy include its use during orthopedic surgeries where it can aid the surgeon in the replacement of damaged joints or in the repair of bone fractures. As a patient undergoing fluoroscopy, you will most likely be given an IV so that the dye, contrast material, or fluids can be administered directly to your bloodstream. You will lie on an x-ray table. From there on, your care will depend on what you are receiving fluoroscopy for. Consult your doctor or nurse for specific instructions regarding preparation for the procedure and the care you will require after fluoroscopy. The x-ray machine that takes the images of your body does not cause pain or discomfort, but it does carry the same risks as an x-ray, namely, that excess exposure to radiation may increase cancer risk later in life. This risk is statistically very small. There is also a small chance the radioactive rays may burn your skin or cause skin damage. The dose of radiation depends on what type of testing you are having done and the more radiation you receive the higher your risk is. 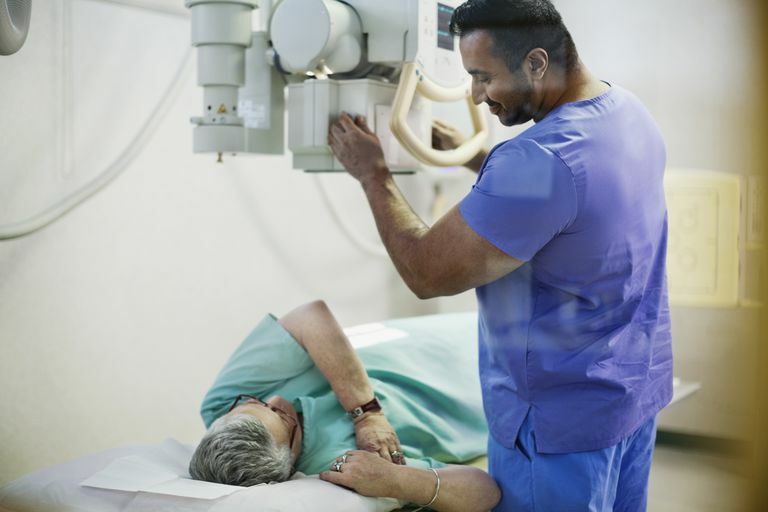 If you are receiving fluoroscopy for a procedure such as cardiac catheterization, the procedure itself may carry other risks such as bleeding or having a reaction to any sedative medications that are used. Be sure to consult your physician regarding this information. What is Cytomegalovirus and What Causes It? How Are Cryptic Tonsils Treated?